So, here is our clarification: These chickens originated from a producer that raises birds in accordance with standards set forth by the Global Animal Partnership…AND they raise birds not in accordance with those standards. The latter applies to the birds who ended up in a dark, lonely room without food and water. Good luck figuring out the difference! No joke, I just received an email from the Global Animal Partnership (GAP) asking Animal Place to rectify what they felt was an error in our reporting. Let me back up. 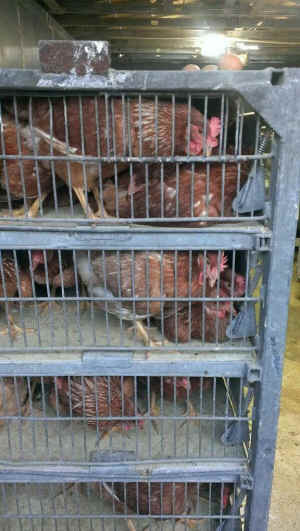 Earlier this week, we posted about a cruelty confiscation involving chickens in Sacramento. More than 200 hens and roosters were left without food and water, and then rescued by the City of Sacramento Animal Services. We posted on Facebook imploring our supporters to assist us in finding placement for the 130 roosters (hens were all placed). In the interest of honest reporting, we immediately contacted the person responsible for securing the confiscation of the chickens and verified the name of the farm from which the birds originated. Confirmation was received that the birds did in fact come from a producer that is Step 3 (chickens) and Step 5 (chickens) certified by GAP. We sure were! Either GAP was lying or there was something amiss with the situation. Further investigation revealed a gap in the GAP program. One producer can operate multiple farms and treat birds differently on each farm. Let’s say there is a producer called CF Ranch. They own or contract with 20 farms, raising chickens for slaughter. Let’s say five of their farms are “Step 5” certified by GAP, another 10 are “Step 3” certified, and the rest are sold to whomever the farmer wants. 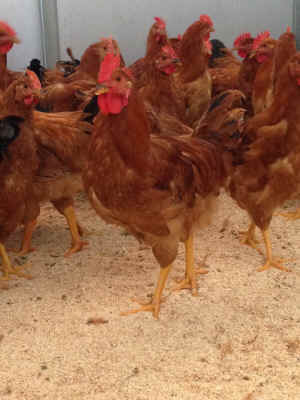 The birds on the Step 3 and Step 5 farms must be treated in accordance with the standards set forth by GAP. The rest of the birds can be de-beaked and sold to places that starve them for four days and illegally slaughter them, apparently. Oops! Let’s also say that on this imaginary CF Ranch’s website, there is no mention of birds who are not covered by any standards. Instead, their website is covered with Step 5 this or Step 3 that or “we care deeply about animal welfare” with a bevy of links to the GAP standards. Well, then you have a picture of what happened to these chickens. The farm that sold these birds to an individual who left them without food and water for four days has at least 16 chicken farms and 6 turkey farms. Some are certified Step 3 (lower rating), some are Step 5 (the highest), and apparently some are “Stepless” and do not adhere to any of GAP’s requirements. Welfare improvements are that – welfare improvements. They are meaningful in only one context – until we achieve a just, vegan world, improving the conditions in which farmed animals are treated is necessary. Welfare improvements are not a solution to ending the exploitation and oppression of farmed animals. They are tools that should ONLY be employed with a goal of liberation and eventual non-use of farmed animals. At least that is the position Animal Place takes. This is one reason we will not name the farm. Animal exploiters see the bottom line. It’s money. And even the farms with a strong desire to be less cruel to nonhumans while they are alive still must make a living. To make a living off farmed animals requires the death of that animal and both measurable and immeasurable suffering. Consumers can help change this by choosing kinder, most just food choices whenever possible. Animal Place believes that the most just and kind food choice a person can make is to eliminate animal products from their diet. Go vegan.